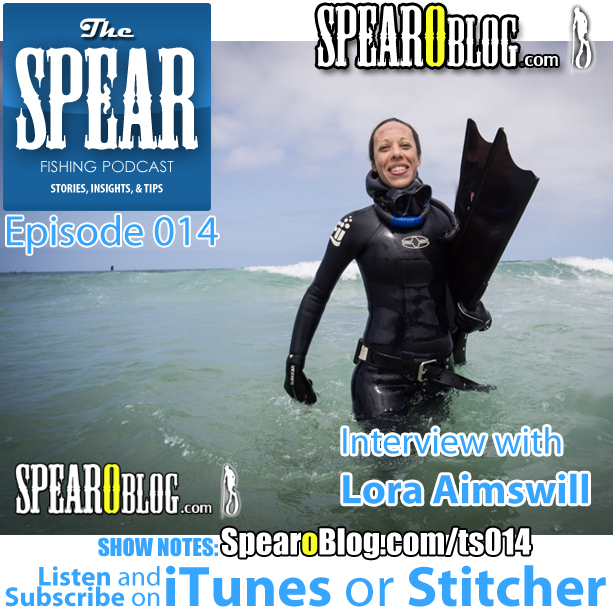 In this episode of THE SPEAR a SpearoBlog show, I interview Lora Aimswill. 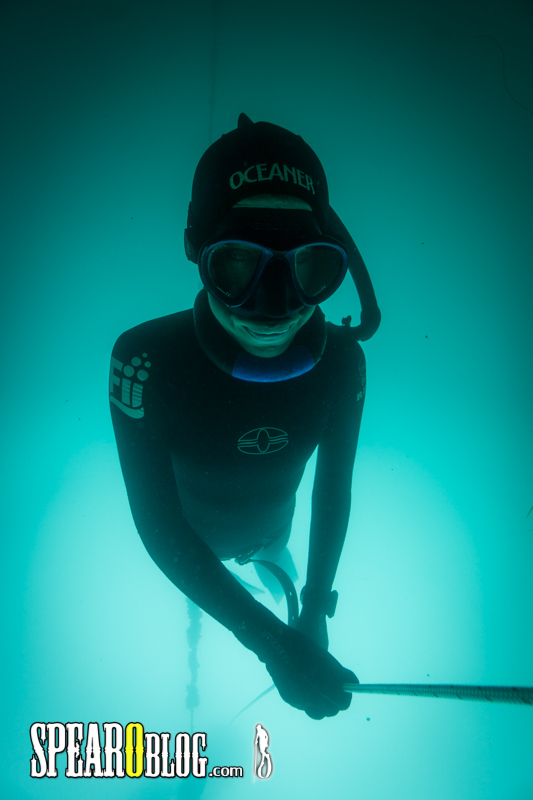 She shares her freediving journey and her passion for the deep. This episode has great tips and a different perspective. RC: Today’s episode is brought to by me if you would like to hear less Ad or no ads there is something you can do. I started a Patreon campaign where listeners can pledge as little as $1 per episode to help me fund the show and take it to the next level. 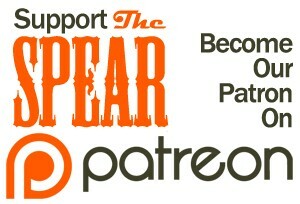 So, do me a favor and visit SpearoBlog.com/give you don’t have to pledge if you can’t at the moment but at least go check it out. 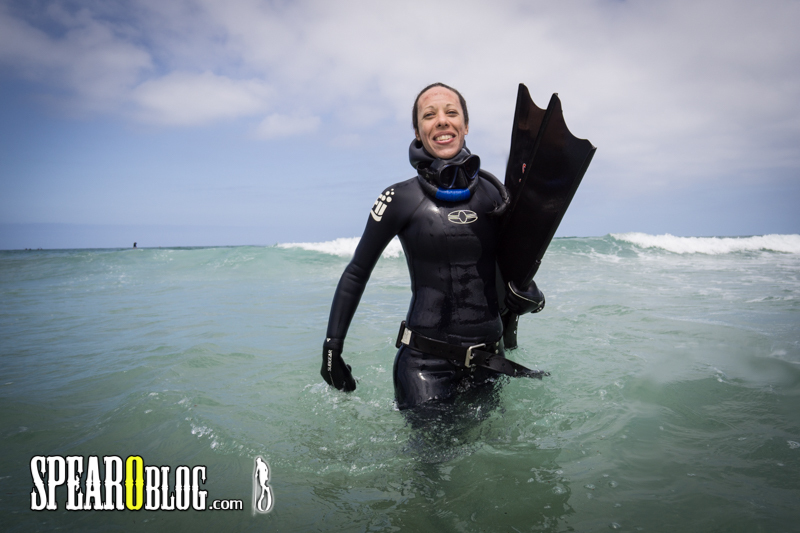 Today I interviewed a freediver, who doesn’t hunt and in fact she doesn’t eat meat. You might be thinking “but this is spearfishing show” and yeah it is, but I believe that in order to become a great spearo you must first become a great freediver. So, who better to interview than a freediver that practices freediving exclusively without any distractions of the spear or the hunt? But before we go to the interview here are the spear community announcements. We have the Jack Prodanovich White Seabass open coming up May 29th through May 31st info@thejack2015.com, we also have the Kirk McNulty White Seabass Classic it’s actually still going on now through May 30th the info for that is at hookbuzz.com. We have the OC Classic spearfishing tournament run by the OC Spearos and that is going on August 15th the info is at OCSpearos.org, click on the events tab and then finally we have the San Diego Freedivers which is my club, the club I belonged to. I am actually the president of the San Diego Freedivers this year and we’re having our 20th annual Blue Water Meet which is happening August 29th, you are all invited so come on down, it is a good event with lots of raffle prices. The info for that is at SanDiegoFreedivers.com. 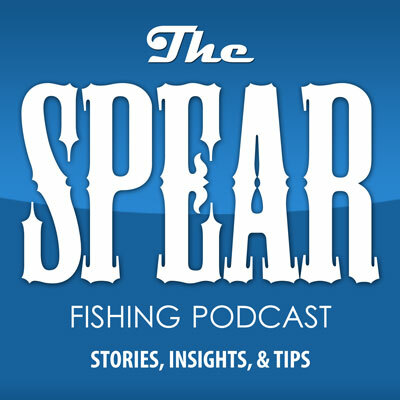 So yeah, if you run a spearfishing club and would like to make any announcements to the spear community, email me with your upcoming events my email is roman@spearoblog.com. Quick announcement I am messing with the service that hosts my mp3 files and I accidentally unpublished episode 9 so if you try to listen to episode 9 last couple of weeks and it wasn’t working for you, it should be working now so thanks for letting me know Laura. Okay, so one last thing is do me a favor tell your friends about the spear if you think it would benefit them. You can just go to the link spearoblog.com/itunes and it will take you directly to itunes and they can check it out. Alright, let’s get on with the show. RC: Joining us today we have a native San Diegan who never spend a day in the ocean past her waist until 2012 when she discovered freediving and realized this was the sport for her. She, has reached depths about 200ft, she is a SSI level 1, FII level 2 and AIDA 3 star certified freediver. She is here to share her stories and unique perspective on the sports of freediving and spearfishing our guest today is Laura Williams. Hey Laura, welcome to the show. L: Thanks! Thanks for having me. RC: Awesome! Yeah, let’s get started. All of the segments for today’s show are gonna be renamed to the freediver, alright so freediving theme and the first segment is the new freediver. Okay? RC: So, tell us a story of how you discovered freediving. L: That story sort of goes back to seaworld when I was 4 years old and I walked into a section in Sea World and I saw bunch of mermaids swimming around in an aquarium (laugh) and I immediately knew at 4 years old that these were girls in mermaid tails, but they were really cool cuz they were holding their breath. So I didn’t wanna be a mermaid I just wanted to hold my breath and be able to swim around in an aquarium. So I immediately went home and became obsessed with my gold fish. L: It’s true. My goldfish lived really long time because I wanted to make sure that they were breathing properly under the water, so when they got sick I would blow bubbles at them to make sure that they live really long time. L: So the goldfish were my first real friends and I basically had an obsession with the ocean but no one in my family cared to take me out there. L: And all I wanted to do is go to the aquarium but no one wanted to go and they dreaded walking around the aquarium so when we finally did get to go it was a huge ordeal to them to have to check out fish. But I just wanted to swim around with fish so I had no idea that there were freedivers or spearfishers and I thought SCUBA diving was something that you did on scooby doo. L: You know, I didn’t watch any of the Jacques Cousteau shows. I was really in the dark and then one day I was over at South Casa and I’m looking at the tide pools cause that’s of course I forced my parents to do on weekends, so I am looking at the tide pools. This guy comes out of the water and he’s wearing all black and he looks mysterious. L: I am about 6 years old or so and like “what are you doing?” and he says “I’m catching fish” and I said “what do you see down there?” and you know we get this question a lot, right? L: When we come out of the water. That guy he said it right, he said “I see lots of stuff, stuff that you can’t see up here in the surface” and I started sticking my head as close as I could to get to the deeper parts of the tide pools. L: No, I didn’t even put on a mask until I started snorkeling in 2012. So, there I am with a freediver, I didn’t have a word for it. L: I have that memory that kinda stood in my head and later on like in the 90’s I saw a show with a freediver who is swimming with whales and they showed her doing some crazy stuff with their stomach. L: Before she was breathing, she was doing the diaphragm exercise. L: And I thought, hah! That’s interesting! She’s doing that she’s swimming with whales and she’s holding her breath and she doesn’t have a stupid mermaid tail on. I was like alright, this is cool so that kinda set in my head for a while but I didn’t know that anybody could do that cause they sort of advertisers for special person. L: I wanted to be a fish. L: So, yeah! So couple of years go by and I decided that I needed to fulfill some goals and one of those goals is scuba diving. I looked up scuba, I did a lot of research and of course as I’m looking at youtube videos I see freedivers and I’m like “wait a minute!” this is really cool. Here’s the fish I’ve been looking for my whole life. L: And I made it my goal to simultaneously do scuba and freediving. L: No, my face was never hit the water. L: Yeah, this is baby stuffs here. L: So next weekend I go back out and dunking my head on the water and that was all. I’m in this little bathing suit, the water is freezing cold and I walked out passed the waves, dunk my head in the water. L: Exactly! I was like “That was good! Alright!” I can do this. I run back in. L: I took some swimming lessons and because I wanted to be a strong swimmer. L: And I knew that I had to do some swim test for scuba anyway. But I went and run to the really terrible wet suit and I already bought my mask and fins and I went out to the marine room and I..
RC: Mask sorry? Scuba fins and and scuba mask? L: And a scuba snorkel too which I have not used since I became a freediver. So I got in the water and I was like “wow! this is my entire world has been waiting for me for this long and then I get mad because no one cared to introduce any of these to me. L: How could I be a native San Diegan and no one showed me this strange orange fish in the water. I was frustrated though because I was renting wetsuits and then I bought my own wetsuit, scuba suit and I knew myself well enough that if I were to buy my own weight belt before taking the freediving class I would probably kill myself. L: So before I even started freediving I knew I was going to push limits. L: I hated being at the top of the water and not being able to get down, but I knew there was light at the end of the tunnel. I spent 5 months snorkeling. RC: Okey, with no weight belt just kinda like bombing like an apple..
L: yeah, and there were few times that I tried to get down and I probably entertained everybody around because I bumped right back up, and it was so frustrating. The thing about that is I had read somewhere that before you become a diver you should snorkel around. Someone said a year, and there is no way I was waiting a year but I took that advice seriously and by taking that advice I think that, that really acclimated me to becoming the kind of diver that I am now. San Diego were fortunate to have the three R’s. L: I made sure to involve myself to that at every chance that I could get. I learned a lot about the ocean, about the conditions, about the geography. L: What was safe and what wasn’t and I think a lot of divers whether you are a scuba diver, a spearfisher, a freediver or a swimmer everybody needs to get involved in the 3R’s. RC: The 3 Rs program is run by the Watermen’s Alliance they basically teach the public for free, how to get in and out of the water safe, they teach you about rocks in certain areas, reefs, so you can navigate all that stuff. It is actually, you meet on the beach. They work with lifeguards, and they’ll teach you all about it, and you actually go in the water without a weight belt, right. RC: So you put on your wetsuit and you jump into the water, once you learned about it they take you through it too. That’s really cool. L: It’s a kind of thing that really gets you acclimated quickly. It is sort of one of those peer pressure things because everybody is going to the cave so now you have to too, it is really good for you though, everybody is jumping off a cliff so you will too, yeah but you know that was really important part of my freediving experience was to get to know the local waters. I took my certification class and passed that in November of 2012. The first time I went under the water was with a weight belt on, I felt like I finally achieved something I’ve been waiting for my entire life. It felt like home. L: Yeah, and that was just on the line so I was anxious to get out to go see some fish. RC: So when you, that’s a huge jump from the 3Rs class? RC: So something I miss here. Did you dive on the line for the first time at the class? RC: Coo, which class do you take first? L: It was the SSI Level 1 class. RC; So, you decided to take the class, what is it like the first time you went down that line? L: I had a hard time equalizing. L: I wasn’t hitting the depths that I was hoping to hit. RC: So what did you? Figured out a way to equalize on that session of did you kinda like..
L: No, I am, I was equalizing but my ear was locking up. L: So I really can’t get pass 25 ft. Maybe it was a little deep or maybe 35? L: All I knew is that I was determined to figure this out so I started doing a lot of research on how to unlock my ears. L: I was wishing that I had done that research a little sooner because it involves diet and exercising your Eustachian Tubes. RC: Where did you read about exercising your Eustachian Tubes? RC: Cool, I like it, that’s a really good book. RC: So your freediving challenge was working yourself into like getting into the water was clearing..
RC: Okay so once you figured that out and you had a little bit more…had an easier time with clearing..
L: Depth. That was all I needed was depth. Every foot that I got further was a success. L: And I remember telling someone once while we were watching a video on youtube, probably of someone like William Trubridge, you know just one of the people that are doing competition freediving and I said to them, Don’t worry I don’t wanna to go that far. L: And I think I lied. (laugh) cuz I just wanted to keep on trying to going deeper. L: So I got the SSI level 1 certification and I was actually talked into taking FII class and that was because there was a all girls class coming up and the person hosting it wanted to include me in it. L: I started became known as a girl that do freedive at the shores cuz I was out there all the time. Yeah, so I took the class and I enjoyed it that was like July of 2014. RC: So that was FII level 1? RC: What did you maxing out on Level 1? L: You know I got down to just about 60 ft. I wasn’t touching the plate and I was still getting locked up here.. but I was super determined and you know I think I was probably a little nervous too. That pressure of having everybody out there, everyone’s waiting for you to breath and I get stuck in my head and I think a lot of students do that. You know, they feel rush sometimes and it is hard to relax when you’re under pressure. L: I kept going and I went out couple of times with SSI instructor and I finally hit 60ft. or 66ft. actually later on. But it was at that point where it was feeling good like it was easy and then that’s when I started going “wooh, I can’t go any further cuz the plates at the bottom, I can’t go passed the plate. L: So I wanted to dive deeper and it was in September of that year 2013 that I posted in the San Diego Freediver facebook page that I wanted to push my limits. I had someone respond who I dove with for about a year we got out there on the line and we pushed it. I started getting passed 70ft. you know 80, 90 and we had plan on taking the level 2 class together. RC: Any AIDA stuff yet? RC: Did your dive friend taking it up with you? L: Yeah, we had a good time with that class. and I didn’t max out. RC: what’s the max on that class? L: I think the hundred and twenty that could be wrong but you know it didn’t matter to me because all I wanted to do was get passed 66ft. and I did. L: you know, and I still had a lot of stuff in my head. I was still really really really in my head and we plan a trip to La Paz and we took the AIDA class. L: And we took all three levels, first one star, two stars and three star and four star all in 9 days. L: Yeah, and I hit some personal best there. Warm water I think helped and at that point I knew that I wanted to compete. There was a competition class in integrated to the course we were taking and so my mind is already going into the competition mode and that sort of where I am now. I wanted to compete, and hoping to compete next year if not late this year. RC: Nice, alright that’s awesome so that basically covers your introduction to the sport. I met you to the club and everyone when you had house… and I think I was there the first time you came to check us out. So you’re expecting like freedivers like strictly freedivers but found a bunch of spearfishermen.. (laugh) what was that like? What brought you to the club? L: Really apprehensive. I was doing some pool training and I jumped in the pool and there was, I looked into the waters and I see this long fins and I was like “Dude, there was like a freediver in here!” Holy cow! I got really excited of course, there was this guy with long fins and I was like there’s guy with long fins in this pool what is that. It turned out to be Andy Smith who is a great friend of mine. L: I have no business in this club. And he was like “No, no no! you’re gonna meet people who freedive don’t worry about it. I said “I’ll think about it” so he dragged me to a meetings, just go to a meeting and I was “alright!”. I wanted to hide in the corner, cuz..
L: I totally did I’m a trendsetter, thats me. I think the hardest part was, what’s the biggest fish you caught? And I was trying to.. I wanted to say something really creative, you know but it just didn’t work. RC: (laugh) So funny. So if you’re a new member or visiting person cuz our the club meetings are open to the public. We do ask that you share a little bit about yourself like, how long have you been diving, and what your biggest fish is so that’s what your friend tells you. L: Yeah, so but you know what everybody was cool and I think someone complimented my shirt because I was wearing a neptunic shirt. L: I thought okay if I choose the right wardrobe. L: haah! You know and so my god alright…The interesting thing was as I got into the spearfishing world and I started diving with Andy. I went on lobster hunts with him, and he also nailed a few fish. I learned that there’s a lot of spearfisher out there that are freedivers. That they want to pursue freediving that they actually enjoy being all at the hunt. RC: Cool, it’s awesome. Good on Andy for introducing you. There is like a whole other set up dive partners ……. L: yeah, exactly and I met cool people. RC: Cool, awesome so we will moved on to the next portion of the show, it is called The Trident this is where you share three pieces of advice for new divers. L: Okay, yeah well my first tip would be to get comfortable in the water, we talked a little bit about the 3R’s. I suggest putting the gun down and snorkel around a little bit. Takes some time, take a couple of weeks you know the fish are gonna be there, you’re gonna have food in the table. Don’t stress out about just get in the water and be comfortable. I’ve seen a lot of guys who have taking class for the first time like freediving class and they’re not comfortable yet. It’s killing their hunting, they’re not practicing proper water entry. L: Their hearts are beating a hundred miles a minute because they are not comfortable and the fish can sense that. L: You know, so get out there put the gown down go have fun. The water should be fun. My second tip would be strive to be a master of your sport. L: yeah and you know and that means again learning to do a proper dive. Be quite. RC: All parts of sports which includes freediving..
L: Exactly. You know if you are out there with a bunch of that and you’re that one guy that’s kicking your fins at the surface scaring fish chances are they may not want you back. L: You know it’s just not gonna happen. So work on your breath hold. Whether its doing exercise at home, dry static tables, doing some laps at the pool. Do a pool exercise with a diver, making sure that you have good gear. Know your gear. RC: That’s your third tip? L: No, no! Being a master. RC: It was like a multi tip, tip! L: yeah! I’m kind of cheating a little bit. RC: Thats good, I like it, I like it! L: You know, being a master of your sport means that you know your gear, that you’re not you know, you’re not getting something that doesn’t fit you right. You want your fins, your wet suit, your mask, you want everything to fit you right. You wanted to able to hold your gun right. You wanna be able to talk to other divers, people who have been doing it longer than you and give them the respect. So part of being a master is learning from other masters. So, you need to be humble and open up to what other people have to say. L: My third tip is take a class and never dive alone. RC: But really, the best thing you can do is learning to control your emotions basically your heart rate, so when you get excited or you got scared. That’s what’s gonna blow your bottom tme..
L:Yeah, you have to relax. You know part of having a good breath hold is knowing your body, right? So if you’ve dove you’re waring a hood. Chances are if you are in San Diego at least you’re wearing a hood and sometimes you can hear your heart beating. L: Take the time to listen to that. You know, it is an amazing thing. When you dive down to your designated depth and your heart just (dat dat dat dat) hear it starts slowing down. L: and listen to it and let it slow down a little more. That’s when you find, you’ll find peace in that. RC: Awesome. That’s awesome. Cool. Let me try to summarize those back up. RC: Tip 1 was get comfortable. Do fun dives. Being comfortable will extend your breath hold. Tip number 2 is be a master of your sport. Being a master means you’ll master all the facts of spearfishing which includes freediving. Tip number 3 is take a class and don’t dive alone. Alright, so now we will going to move on to the next segment which is The Seasoned Freediver or The Salty Freediver. RC: It is basically, you make it pass all your beginner trials and tribulations and you’re a competent free diver and we talk about basically most epic freediving you’ve been on. RC: That’s like right to the good stuff. RC: Tell me the story …. L: So we get to La Paz and my..
RC: Who did you go with..how did the trip come about..
L: And it came because we both wanted to do to the competition. He wasn’t to excited about sea life, he’s like “oh, I just wanna dive depth. And I was like “yeah, you know what you will just wait” because you haven’t seen anything yet. The instructor was telling us that she could get us into some whale sharks. So, we went out after we did some line diving. And on the way back in we stopped into a small lagoon and there were whale sharks and we were jumping in the water like no wet suits and the water was kinda cold and we’re chasing this whale sharks cuz they go fast. L: When we finally go to won, my reaction was wow this is a really big school bus. L: Yeah, They’re like planes. L: And I was swimming a little long at the side of this one. They’re so close you could see every details, every small spec on them. L: I was by the head and I can see the eye. RC: How big was the eye? L: Yeah It was super, it’s a fish. Fish has small eyes. I don;t know, but there..
L: I did. But I’m kind of like “ I really don’t care about you” intelligence just. I wanted to eat, don’t get your hand in my mouth cuz they have really big mouth. L: What made it cool was actually chasing after this one and he’s kinda came to a stop from speeding and there were some boats that had come to the location we were at. L: There was a lot of commotion going on in the water and one of the boats saying “Hey! guys, jump in, jump in the waters. So he’s telling his tourists to get into the water, they’re jumping in I had just going to dive my dive watch has an alarm that tells me after I’ve been on the surface for 3mins, so now my dive alarm is going, so I hear commotion to my right, my watch is beeping. I see a second whale shark coming in my direction, and the whale shark where we were near was probably like “alright, you know what I’m done with this..I’m moving on and I was positioned at the wrong spot on top of the whale shark. I wasn’t really anywhere near it but it decided to do a 180 on me. L: and it smacked his tail right across my mask and my leg. And I feel like I’d just run it into a cement wall. It was a cement wall. It felt like cement and my first stop was “Men, this is my first day in La Pass and I just broke my mask, broke my nose, I have that cold sensation running down my face, right? L: My dive buddy says’ “No no you’re okay. Like alright, I looked down and there’s this huge gauge in my knee. Like as if you have fallen on cement. L: yeah and this is my first day, no! So, here it is there’s this gaping wound and my wetsuits rubbing on this wound like the whole time I’m there. L: You know bleeding and stuff but and then there’s this boat people we are staying with and they’ve been there for a while and then say “So, I heard you got hit by a whale shark” of all the years I’ve been out here, I’ve never heard of anybody getting hit by a whale shark. L: So I was that girl. And that trip was, it was awesome because I was in a super blue water. I was reaching personal bests and it was just all around fun. The whale shark that took the cake out. R: It’s nice, it’s awesome. Was that the same trip you took where the level 3 stars ..
L: Yeah, that was lots of fun. RC: So the instructors must have give some good advice, right? RC: Okay. So, What’s been maybe the best piece of advice anybody has given you about free diving? L: Let go. Take that word with you. Whether its freediving or spearfishing take that down with you. Let go. just let go. You’re going to improve your dive in time, you’re going to relax, you’re going to get deeper. Just let it all go. RC: Alright, tell me about the wetsuit. L: Even though it’s a python, because it’s super hard to get off. and it’s probably really entertaining to watch me get it off. It’s my favorite piece of gear because it keeps me warm. Having a good wetsuit is priceless I actually I wish that I had bought this wet suit well before I did. RC: nice, what kept you from buying it before..
L: Just money and just procrastination like “oh do I really need it?” Well,, winter came and a good tip here. Here’s an extra tip in order to lose weight get in the water and shiver. Cuz you will lose weight. RC: Alright, just make sure you’re not hypothermic. RC: Do it in small amounts of time. L: I think that the last time I did some research, I wanna say about 300 calories in 10minutes of shivering. L: SO you don’t really have to shiver for too long cuz you do need to shiver. So, when that happened I bought the wetsuit and also being cold is a detriment to your dive so it’s better to not be shivering when you’re diving. RC: Nice. This final segment is called The spear so we’ll modify it, we’ll just make it The Freediver, what the experience you have with freediving. What’s been the single most important insight you’ve had about for freediving. L: Yes, don’t get into the water when your gut tells you that it is not a good day to dive. You know, people tend to roll their eyes at that kind of magic of whatever. L: Bu when it comes to the water there is something about listening to your gut that is really important and there’s a chain of events that happened were you know if you’re having a bad day. You have a new piece of gear that not quite fitting right. Those were the days that turn out to not be so good. If you’re looking at the ocean, you know it’s a little angry but think “oh, I really don’t wanna do this but I’m kinda little pressured to do it. You know those are the days you’re going to end up smash on the rocks and I’ve seen it happened, I’ve heard it happened. When you’re in the water, if you’re feeling tired, or if you feeling dehydrated, you’re getting sick. Call it, don’t be afraid to speak up and leave. RC: Alright, so since most of the audience here are spearsifshermen or spearfisherwomen, spearfishers, do you have any parting words of advice for them. L: Yeah, amm I’ve had the opportunity to swim with some guys who have been doing spearfisfhing for a while and I’ve been in the community for a while. Some of the things that I’ve learned are that it’s super important to be conceansious of the reef you are hunting. Even though a fish is legal, you might want to take a look at how that reef is going to be affected when you hunt that fish. Maybe it’s over hunted there and you may need to move to a different reef. I know there’s a lot of old timers that will tell you that they hunted reefs and pretty much decimated populations and they regret it and they’ve learned from their lessons and those guys their trying to teach us what they learned and it’s super important to listen to those guys because they’ve seen what’s happened. RC: Yeah you know that make sense so just because your fishing within the limits of the law doesn’t mean that reef could sustained that, so cool. Awesome. L: Yeah oh should we just do TranquilDeep, yeah , okay, Alright. TranquilDeep on Facebook, I forgot about that. RC: Awesome. Cool. Well, Laura those were awesome stories and it’s good getting that unique perspective on freediving. I really enjoyed it, it was fun. Thank you for taking the time to come out here sharing with us your freediving journey. That is for the spear episode 14, the show notes are in the spearbolog.com/ts014. Let me know what you think about the show, you can email me at roman[a]spearoblog.com you can also send me a tweet, my twitter handle is @SpearoBlog so that’s it for episode 14 and have a great weekend, thanks for listening and dive safe.